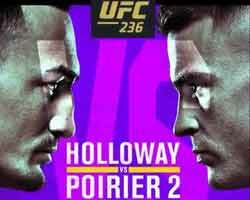 Review: 2014-07-05, tough exchanges and good finish: Justin Gaethje vs Nick Newell gets three stars. Both undefeated and with the same record of 11-0-0 Justin Gaethje is ranked as the No.20 lightweight in the world (91% finishing rate, with only one victory by submission) while the one-armed fighter Nick Newell has two victories by ko/tko and 8 via submission. Gaethje has already fought in 2014 defeating Richard Patishnock in a bout valid for the Wsof Lw title (=Gaethje vs Patishnock) while Newell debuted in 2013 in the “World Series of Fighting” beating Keon Caldwell (=Newell vs Caldwell) and Sabah Fadai in the first round (=Newell vs Fadai). 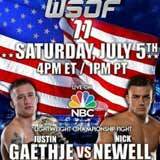 Gaethje vs Newell, main event of WSOF 11, is valid for the Wsof lightweight title (Gaethje’s first defense). Watch the video and rate this fight!